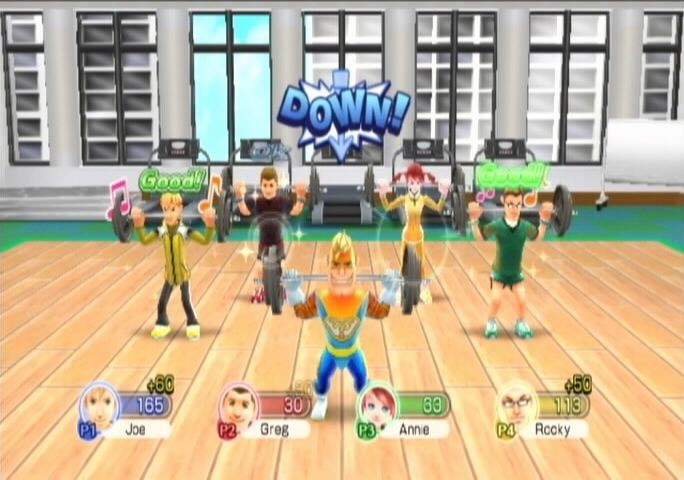 Hang around any Nintendo-themed internet forum, and you're bound to find similar posts over and over, all declaring the same thing: The Wii needs more party games! Alright, obviously that's not the case. The poor little Wii has more party games than it knows what to do with, making it difficult for new entries in the genre to get a gamer's attention. After all, doesn't everybody who wants a party game already own one? Do we need more? As the old Zen kōan goes, if a party game is released in GameStop and nobody cares about it, does it make a sale? We can't answer these questions, but we can say that despite the fact that it might have the single most generic name imaginable, Family Party: Fitness Fun is a pleasant surprise among the sea of middling, effortless party games. Featuring a total of 30 very different events (though about one fifth must be unlocked), this release gets off to a very good start simply because of the variety of activities on offer. No two feel much alike, and that's a pretty remarkable feat. Toss in balance board support and you'll find an additional way to mix up the proceedings, though to wring full enjoyment from the package it's not really necessary. Each game can be played by up to four players, sometimes in teams depending upon the nature of the event. 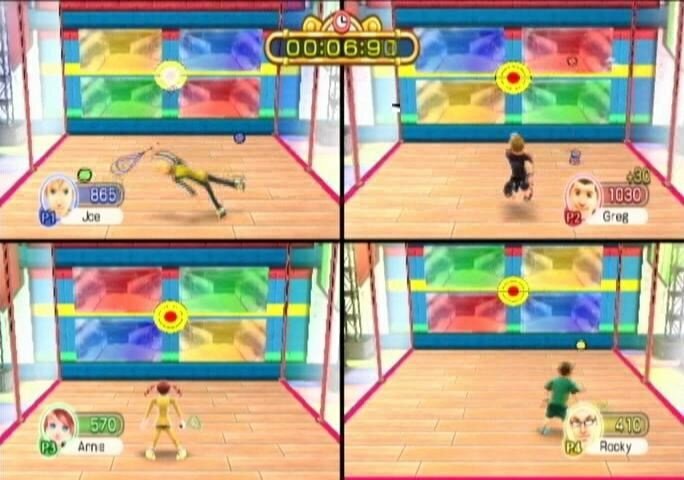 If fewer than four people are playing, the computer will take over the vacant slots. Players are recognisable by their colour and the avatar they've selected, making it quite easy (usually) to keep track of your character during play. While not officially designated as such, the games themselves tend to fall into one of several types: Sports (squash, basketball, etc. ), Fitness (weight lifting, dieting, and so forth), Brain Training (selecting ascending numbers, guiding balls into receptacles, etc.) and American Gladiator-like competitive events (mine cart racing, being fired upon as you cross a bridge, and so forth). The variety included, however, is something of a double-edged sword. On the one hand, it more or less assures that everybody in the room will have at least some number of events that they enjoy. On the other hand, if you only enjoy one type of event, you might feel that all of the others go to waste. 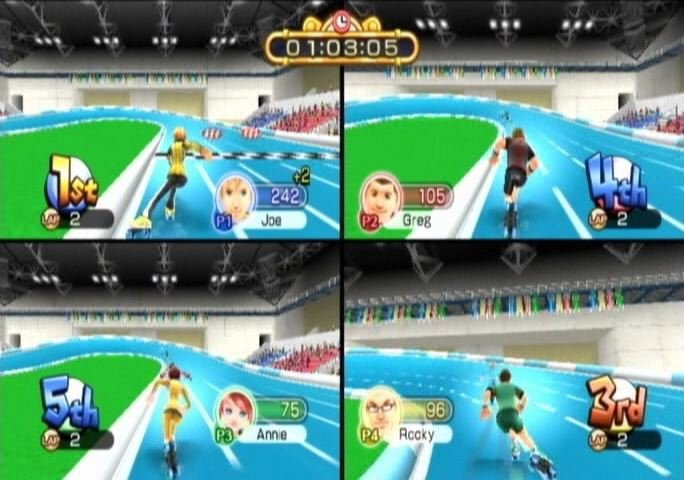 Fortunately, you can organise a schedule of events before the competition begins, which will allow the players to avoid any games that they don't particularly enjoy without having to return to the menu. 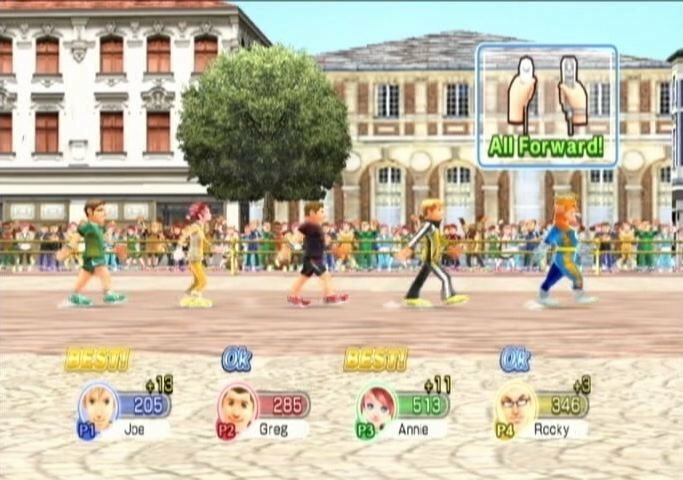 There's no larger overworld or game board from which events are selected, meaning that the mini-games are not only the main attraction – they're the only attraction. But fortunately, while this may feel a bit simplistic, it does not feel slight, as it's clear that the effort was well spent on what's there. Most of the events control quite well. There are a few exceptions (Dodgeball seems particularly fickle, and Red Light Green Light is the stuff of mini-game nightmares), but on the whole, the controls react about as well as one can legitimately hope. Some of the games opt for a cheap waggle where a button-press would better serve the experience, and you'll sometimes find yourself using the D-pad to guide crosshairs that really should be IR-controlled, but aside from these periodically baffling choices, it's a fun and tight experience once you know what to do. Unfortunately, very few of the games are intuitive enough to let you dive right in. You may know how to play paintball, for example, but you don't know how this game wants you to play paintball, and even though similar actions appear in many games (moving, throwing, firing) they are almost never controlled the same way twice. This means that you and your friends will spend a lot of time reading on-screen instructions and viewing tutorials. These are optional, which is certainly a good thing, but we wish you the best of luck trying to figure out how to play these games without them. Visually, the game is nothing much to speak of. In many events the screen will split into four equal boxes that seem a bit cluttered, but with the exception of Squash (in which each of the four boxes is further subdivided into another four boxes!) the action never becomes overwhelming. The music, as well, is unremarkable, but it's pleasant enough and never becomes an annoyance. 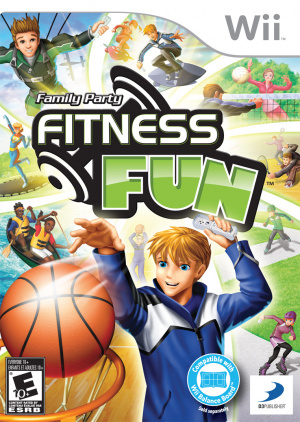 Though flawed, Fitness Fun is still more rewarding than many other party games on offer. It may not be the pinnacle of the genre, but it manages to stand out from the crowd by virtue of its tight controls, welcoming flexibility and varied gameplay. The presentation might look a little cheap, but most of the games are both fun and addictive. It's unlikely that the waggling will make you particularly "fit," but the "fun" in the title is one word with which we certainly can't argue. It looks like the people that decide who reviews what game thought they were giving you another 1 or 2/10. I don't see who buys this stuff. Sounds good for a large party where no one will be playing for long. Hopefully the price is low. I harbor similar suspicions, yes. Overall, a pretty nice surprise! That kid shooting the ball looks weird. Pft. Like anyone would buy this anyway. 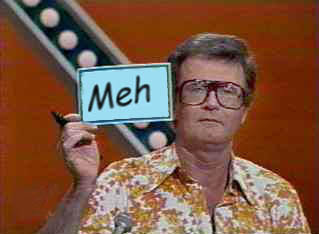 It's an honor just to have Charles Nelson Reilly visit my thread. is this the same family party wiiware game developers ?